Choosing a new roof for your home can seem like a daunting task, but the process can proceed quicker than you might expect. Speed can be just the thing if you are trying to get your roof completed before winter arrives and keeping a few key points in mind can really aid in your decision! First, realize that not every material will work for every roof. A flat roof would require a different material than a very steep roof. Materials like slate or tile are very heavy, so the structure of many homes would not be able to carry the load. Next, consider cost and curb appeal. If you are working on a tight budget, then asphalt shingles are the way to go. This is by far the most popular option as the shingles themselves are inexpensive, installation is very simple, and they come in a wide variety of colors to match your home. More expensive options include wood, metal, tile, and slate. All of these options have a longer lifespan, but the materials cost more and are more expensive to install. Often times, your home, existing roof, neighborhood, and energy needs will help make the decision for you. 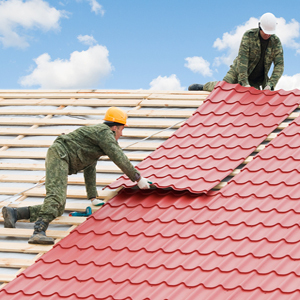 For instance, if you plan to install solar panels, you may need to adjust your roofing materials a bit. Also, if you have a home owner’s association, it’s best to check in with them before getting bids, as many times they will have certain specifications for new roofs. Lastly, be sure to find a great designer and installation team to help you make the best decisions and ensure the job gets done right.